Detailed finite element models with two adjacent tanks were developed to evaluate the variation of thermal, operating, and seismic loads around the perimeter of the tanks. PNNL authors on four research teams recently received the newly established "Superior Paper" award for papers presented at the 2015 Waste Management conference (WM2015), sponsored by WM Symposia, Inc. (WMS). In congratulatory letters announcing the initial awards, Gary Benda, WMS Deputy Managing Director, said each paper "demonstrated superb knowledge and understanding, and lays the foundation for future waste management endeavors." Ken Johnson, John Deibler, Naveen Karri, Kellie Airhart (PNNL), George Abatt, Ken Stoops, Larry Julyk, and Brian Larsen (Becht Engineering) were awarded for their paper "A Summary of the Hanford Single-Shell Tank Structural Analysis of Record." The paper describes the PNNL analysis commissioned by Washington River Protection Solutions, LLC (WRPS) and the U.S. Department of Energy (DOE), Office of River Protection to better understand the integrity of Hanford single-shell tanks (SSTs). PNNL used finite element analysis to predict the structural response of the SSTs to historical thermal and operating loads, and design-basis seismic loads. Becht Engineering conducted the seismic analysis. 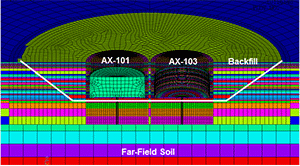 The paper describes the engineering methods used to determine whether four major tank designs meet the structural design requirements of American Concrete Institute Standard ACI-349-06 for nuclear safety-related structures. The bounding thermal, operating, and seismic loads analyses for each tank type did not reveal any deficiencies with the Hanford SSTs that jeopardize their structural integrity. The analytical results support the use of single-tank models in performing the SST analyses of record and will serve as key input to the formal tank integrity assessment due in 2018. 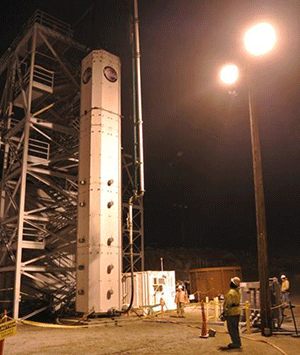 Three tall column experiments were conducted at the Cold Test Facility at the Hanford Site to test a theory that gas retention and release would change as waste depths increased. Joseph Meacham, Jordan Follett (WRPS), Phil Gauglitz, Beric Wells, and Phil Schonewill (PNNL) were awarded for their paper "Gas Retention and Release from Hanford Site Sludge Waste Tanks." Gas retention and spontaneous release from Hanford Site waste can potentially cause worker injury or equipment damage, and as a result, the Tank Farms Documented Safety Analysis has specific waste storage requirements. The paper reports new conclusions about gas retention and release behaviors in Hanford Site sludge waste, including criteria by which to differentiate between the behaviors of sludge waste and saltcake waste stored in tanks. Criteria defined for waste characteristics and process behavior identify the specific wastes and tanks that, based on previous operating experience, will have low gas retention and will not exhibit large, spontaneous gas releases. Tank waste that satisfies the criteria for mass ratio and liquid to bulk solids density, and has process data confirming its typical Hanford waste sludge behavior, does not pose a significant risk of a large spontaneous gas release. Related simulant experiments, conducted at the full depth of a Hanford waste tank, showed that gas retention and release behavior does not change as sludge waste depth increases. The results refuted a key theory in the technical literature that suggested a substantial increase in gas retention could occur below a specific waste depth. Matthew Asmussen, Jim Neeway, Amanda Lawter, Wayne Lukens (Lawrence Berkeley National Laboratory), and Nik Qafoku were awarded for their paper "Technetium and Iodine Getters to Improve Cast Stone Performance.” Cementitious waste forms, such as Cast Stone, can be used as low temperature waste forms for the solidification of liquid wastes at Hanford. Cast Stone is a possible candidate waste form to provide supplemental immobilization of low activity waste (LAW). The awarded paper describes how adding immobilizing agents known as “getters” to Cast Stone may improve its performance in selectively sequestering radionuclides of concern and possibly reducing their release rates over long periods of time. Batch sorption tests were conducted to determine the getter effectiveness indicated that tin-containing getters had the highest removal rates of Tc in deionized (DI) water and that KMS-2, a potassium metal sulfide, had the highest performance in a LAW simulant solution. Of the getters for 129I, silver-exchanged zeolite had strong performance in both DI and the LAW simulant, making Ag-Z a strong candidate for the sequestration of 129I. Further tests will incorporate these well-performing getters into the Cast Stone formulation to demonstrate their effectiveness in decreasing the diffusivities of both Tc and I from the cementitious waste form. Effective removal of these radionuclides from Hanford waste is expected to help reduce the environmental impacts associated with the cleanup of the Hanford Site. 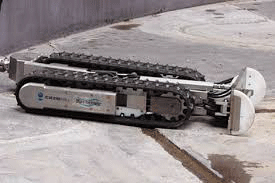 Hanford-adapted FoldTrack device represents one successful mechanical cleaning approach. It is used inside unobstructed tanks to mechanically break up chunks of waste and move solids to the pump inlet. Gary Peterson (DOE), Elizabeth Hoffman (Savannah River National Laboratory [SRNL]), Michael Cercy (SRNL), Chris Brown, and Kirk Cantrell (both PNNL) were awarded for their paper titled "Department of Energy Tank Closure – An Examination of Alternative Approaches. It addresses how closure of DOE's 230 remaining active single- and double-shell underground storage tanks poses unique technical, regulatory, and resource challenges at four sites across the DOE complex. Ongoing DOE site waste retrievals, residuals sampling and analysis, and closure actions provide an opportunity for improving the understanding of the risk and cost implications of retrieval and closure methods that can be applied to subsequent tank farm closures. This paper discusses projects addressing more efficient and cost-effective tank waste characterization, retrieval, and tank cleaning approaches and closure alternatives, and examines the possible use of a tank closure strategy that is informed by risk rather than subjective criteria. Projects cited are focused on 1) optimizing existing tank cleaning methods and further developing promising methods; 2) developing a strategy for optimized retrieval of waste tank heels involving minimal oxalate additions and the retrieval of alpha-emitting radionuclides; 3) working through technical and regulatory issues with regulatory agencies; and 4) recent experimental results and new models of concrete performance and groundwater movement that are improving the assumptions used in performance assessments and decreasing the uncertainties, allowing for a better understanding of the expected circumstances. Near-term project activities involve establishing the sample characterization protocols needed to develop contaminant release models for residual tank waste samples, identifying interim stabilization approaches for residual tank waste solids, and quantifying the total risk reduction and cost savings that could be realized through the implementation of a risk-informed retrieval and closure strategy. WMS established the Superior Paper recognition at WM2015 to recognize the distinguished contributions of authors and coauthors to the advancement of radioactive waste and radioactive material management.